Louis Wain and Pete in 1890. Louis Wain was born on August 5, 1860 in Clerkenwell in London, England. He would be the only brother to 5 younger sisters who would live at home and never marry. Born with a cleft lip, doctors told Wain’s parents that he would not be able to go to school or be taught until he was 10 years old. Even after trouble with truancy in school, Wain found his way into the West London School of Art where he studied art and eventually became a teacher there. At the age of 20, Wain had to take over as man of the house when his father passed away. He soon gave up teaching to become a freelance artist. The career change proved to be a very successful one. He made a good money on his drawings of animals and country landscapes. Always an animal lover, it was his hope to make a living painting portraits of dogs. Quite a scandal at the time, Wain married his sister’s private tutor, Emily Richardson, when he was 23 years old. She was 10 years older than him. Not long after the marriage, Emily fell ill with breast cancer. To make her smile, Wain began drawing the stray cat (Peter) that the couple kept as a pet. It was unusual during this period of time for people to keep cats as house pet. Cats were still seen more like a farm animal – a necessity to keep rodent populations under control. Emily loved the cat drawings and made him promise to continue drawing the cats. She would die only 3 years into their marriage. Cats drawn by Wain showing his anthropomorphic style. This image in in the Public Domain. Little did Emily know that her promise would inspire the art that would be her husband’s legacy. Louis Wain kept his promise to continue drawing cats. Wain became known all over Victorian London for his cats. At first they were very realistic portraits of cats, but slowly a new personality emerged. In 1886, Wain drew A Kittens’ Christmas Party for the Illustrated London News, in which he portrayed his first anthropomorphic (having human characteristics) cats. Over time Wain’s cats became more and more human-like. He said that he would go find people doing things around town (like sitting at a restaurant) and draw them as cats. Wain’s art showed cats standing up-right, wearing clothing, drinking tea, smoking, playing musical instruments, play cards, and more. He was very prolific; he illustrated more that 100 children’s books and his drawings appeared in many other types of publications. A cat drawn by Louis Wain during his stay in the mental hospital. Unfortunately, Wain was not a very good businessman. A lot of people took advantage of his money and duped him into bad investments and get rich quick schemes. He didn’t seem to know how to properly barter with companies for royalties on his work. Even after a cartooning job in New York City, Wain found himself back and home living with his sisters and without much money to show for his work. Mental illness took its toll on Wain later in life. Eventually his fits and outbursts became too much for his sisters to manage so they had him placed in the poverty ward at Springfield Mental Hospital in 1923. The conditions were so bad there that Wain’s predicament became the talk of the town. H.G. Wells, a fan of Wain (and author of the famous science fiction novels War of the Worlds, The Time Machine, and The Island of Dr. Moreau) and Prime Minister Ramsey MacDonald personally paid to have him relocated. Wain spent his last 15 years at Bethem Royal Hospital where there was a garden and a group of cats for him to enjoy. He continued to draw until his death. Cats drawn later in life by Louis Wain. 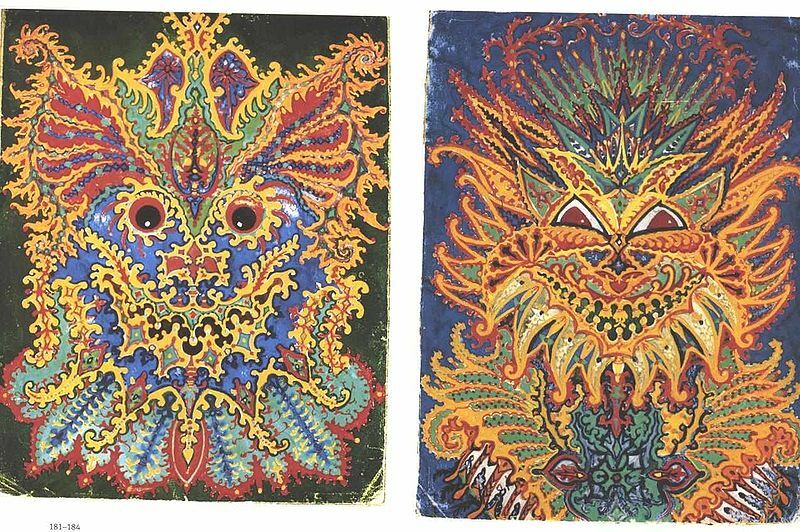 There is a lot of controversy over Louis Wain’s mental illness. He is most popularly described as having had schizophrenia. The theory (which is still being researched) is that his schizophrenia was caused by Toxoplasmosis, a parasite infection that humans catch from cats. A psychiatrist lined up a series of Wain’s drawings to show how they were affected as the schizophrenia developed. It appears that Wain’s cats went from whimsical figures to kaleidoscopic monsters. Others claim that schizophrenia can not be proven by this series of drawings because we do not know which order they were painted in. Dr. Michael Fitzgerald believes that Wain may have been suffering from Asperger’s Syndrome. Sometimes people with an Autism disorder will have what is known as visual angonsia. This means that the visual processing part of their brain is not functioning properly and so they have difficulty recognizing objects even though their vision is fine. These people describe objects as blurs of color, lines, and details that have no meaning. Wain’s later drawings could be his way of trying to make sense of the shapes and colors he was seeing without being able to identify the objects visually. Fitzgerald notes that Wain’s artistic technique never degraded as one would see in a patient suffering from schizophrenia. PreviousDo You Hear What I Hear? You’re very welcome 🙂 Louis Wain’s cats really are beautiful. Thanks for educating us on so many topics with the common denominator being cats. I can see you did a lot of work for your blog post. It makes your cat site unique among cat blogs! Cool history. I love these posts. Thanks 🙂 I love writing these posts. They are fun. And yes, I will most definitely stop by and vote for you. I’ve come across this artist’s work before! So wonderful. I can really relate with the personification of cats like in his drawings. Such fun creatures cats are, each as unique as us humans. I just discovered your blog and it looks brilliant so I decided to hit follow! and guess what!? The artist Louis Wain once lived on the square where I live, isn’t that amazing! I can’t wait to explore more of your blog! Purrs from, Morris the Cat. That’s really cool! I bet you hear more than your share about him then. I followed your blog too. I’m a little bit behind on things at the minute, but I will be over there learning more about you very soon 🙂 Thank you for the purrs! Cinco and Manna send purrs to you as well.